Royal Palm is a delightful elevated complex with superb views over the picturesque town of Los Cristianos with its pretty harbour and beaches. The centre of the resort is approximately a 15 minute walk away and there is a variety of shops, bars and restaurants within the immediate area. Built in Andalusian style with typical Spanish tiled roofs and ornate balustrades, Royal Palm is an extremely attractive complex with beautiful gardens of tropical plants. 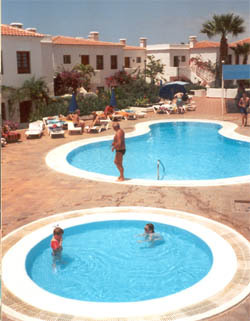 At the centre of Royal Palm is the Plaza and to each side of this are two swimming pools and a separate childrens' pool. The complex also features a very popular Mexican restaurant and bar, which is open during the evening. A relaxing holiday away from the town centre but with easy access to all facilities. Not suitable for those with walking difficulties. Car hire is not necessary at this property.